Please note that MonetizePros calculates all aggregated figures while making several assumptions, which are described in the Methodology section. This page aggregates publicly available information regarding email CPM rate averages and ranges. A long list of legitimate, engaged subscribers can be an extremely valuable asset to have, as it represents an opportunity for a recurring stream of revenue. This page offers some insights into the average revenue rates that can be derived from email monetization efforts. Before we dive in to the data points we considered, let’s take a look at some of the basics of email monetization. “Rent out” email lists to third parties. Note the clearly marked “advertisement” in the screenshot above, in this case for a Facebook retargeting platform. The second involves a much larger advertiser presence. Instead of a banner ad surrounded by your content, a sponsored email contains exclusively content created by the advertiser. All the publisher does is rent out the list in order to allow that advertiser to access that audience. 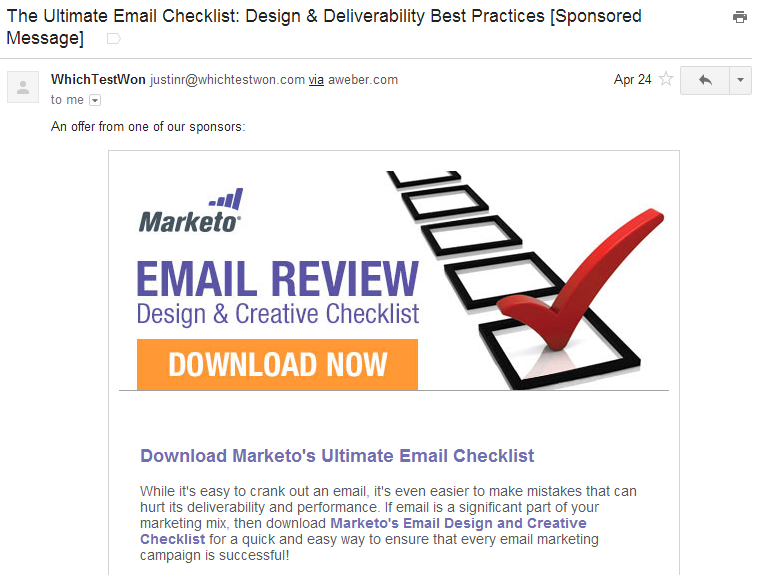 Note that the email comes from WhichTestWon–whose newsletter I subscribe to–but features Marketo content. These are two different companies; Marketo is paying WhichTestWon for the ability to send this email to their distribution list. 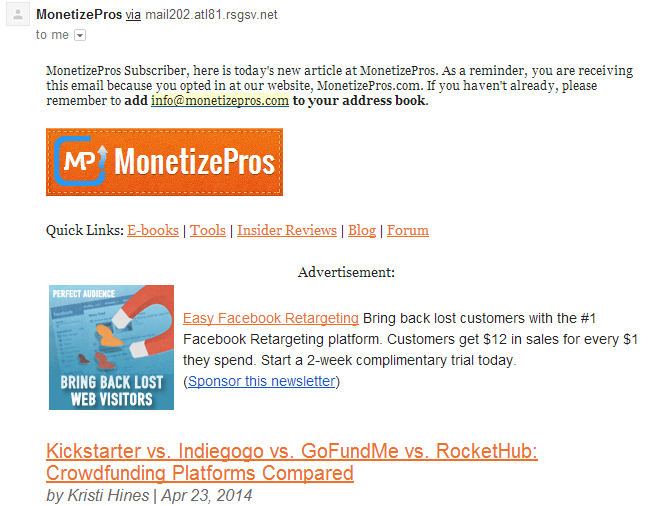 The revenue opportunities between these two types of email monetization strategies are going to vary significantly. Publishers should charge much more to rent out their list for a sponsored email than they do for the placement of a relatively small banner ad within the email. Different Sizes. There are very different types of display ads. Many averages include text ads, which tend to cost less than traditional banner ads. There are also different types of image-based ads, including rich media ads and ads that show video. The concept of “visible CPM” has gained traction in recent years across all aspects of display advertising. But it’s particularly relevant when it comes to selling email ad units. There are two ways to measure the effective CPM realized on an email ad unit: 1) based on the number of recipients to whom the email was sent or 2) based on the number of recipients who actually opened the email. Because open rates for even the most engaged audiences are well below 50%, there can be a major difference in these calculations. Generally, email CPMs are quoted based on the number of subscribers on the distribution list. That means that advertisers pay that same rate for the emails that are opened and read thoroughly as for those that are sent to the trash before ever being opened. In this case, the relationship between the two is simply the open rate on emails; we have an above-average open rate of about 30%, meaning that the CPM on emails sent is about 30% of the CPM on emails opened. In order to provide an apples-to-apples comparison to the other primary data point referenced below, we used the CPM based on emails sent of $4.45. These figures also reflect the net CPM earned by the publisher. 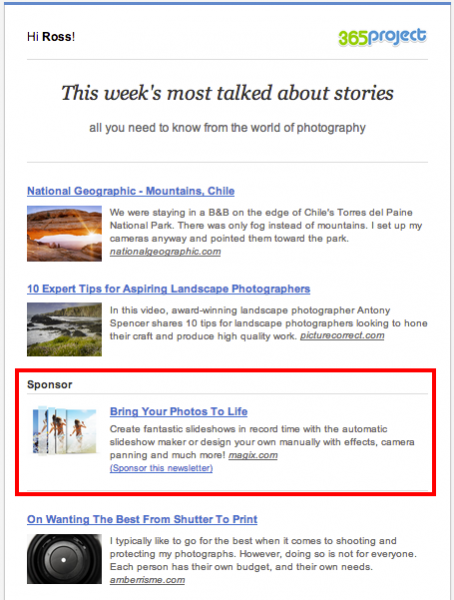 We use NewsletterDirectory.co, an email ad network, to fill ads within our email newsletters. Assuming a 50% network cut for this service, that yields a gross CPM of $9.90. 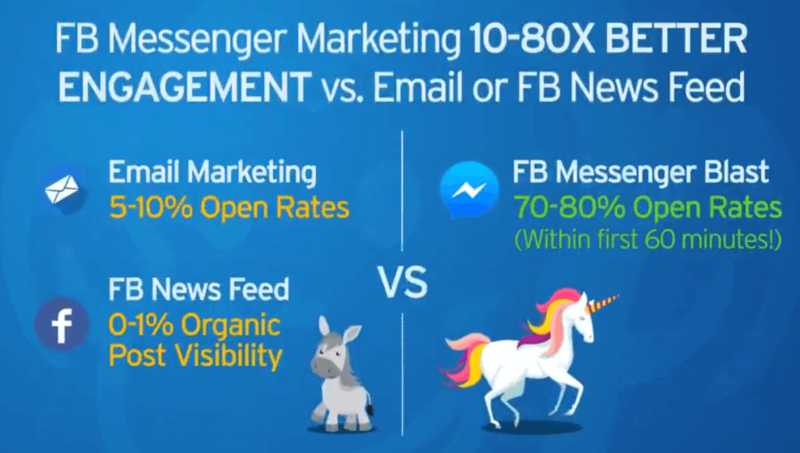 In other words, advertisers are effectively paying $9.90 to have their ad run in 1,000 of our email newsletters–including both unopened and opened emails. This amount is split between the publisher and the network. BuySellAds is a marketplace where advertisers and publishers can come together to create display ad campaigns. Publishers can list their inventory on this site, creating a centralized location for advertisers to browse available inventory. 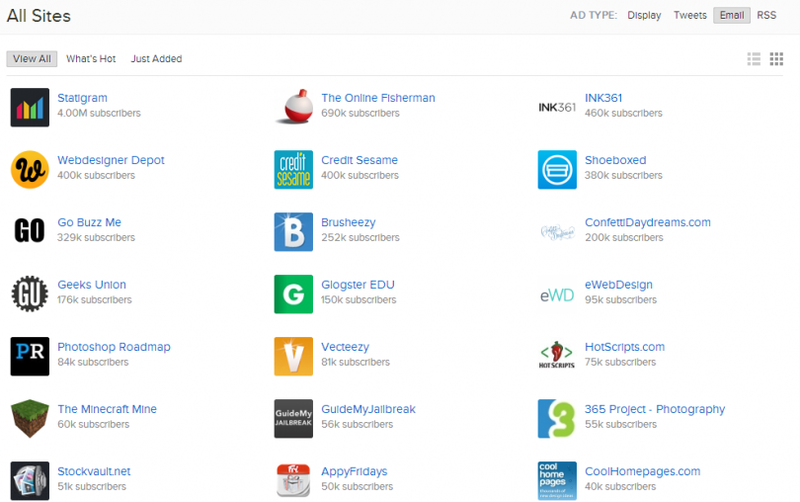 In addition to traditional on-site ads, BuySellAds allows publishers to sell email banner ads. In order to come up with an estimate of an average rate, we examined the 50 largest email lists on the site. The sizes of these email distribution lists ranged from 20,000 to 4 million. These sites were in a variety of different niches and the ad opportunities were for various sizes (e.g., 468×60, 300×250) and locations within the email newsletter. These figures represent single ad unit RPMs; they do not take into account the cut taken by the marketplace in exchange for their services. In other words, the net amount earned by the publishers will be quite a bit lower. It’s also worth noting that the huge range present in CPMs exists here as well; the most expensive list costs more than 250x more than the cheapest. The presence of a few high-priced outliers pushed the average up considerably; excluding the five most expensive items brought the average down to $3.85. To reflect the impact of these outliers, we used the median of this list ($3.45) in our calculation. The average computed was inflated by a few outliers on the high end. Specifically, three sites had requested CPMs above $20. As such, the median is considerably lower since these high end outliers have less of an impact. The CPMs used in this calculation are, as mentioned in the bullet above, requested CPMs. While many of them are partially or completely sold, many are available for purchase. In other words, there are no buyers present at the requested rates in many instances. Data on CPMs for dedicated emails are even tougher to find, as there is no central marketplace that publishes market rates and the prices can vary significantly depending on niche. Since the sources above do not use a consistent methodology, date range, or system, please note that the MonetizePros aggregated values are calculated via an ‘inexact science’. I.e., there is some napkin math here; we do however make an effort to be as transparent as possible, and thus our methodology notes are listed below. In this case in particular, the information available on average CPMs for email banners is extremely limited. While any conclusions drawn from a limited sample size should be viewed cautiously, we believe it is still possible to establish a meaningful average from the data included above. 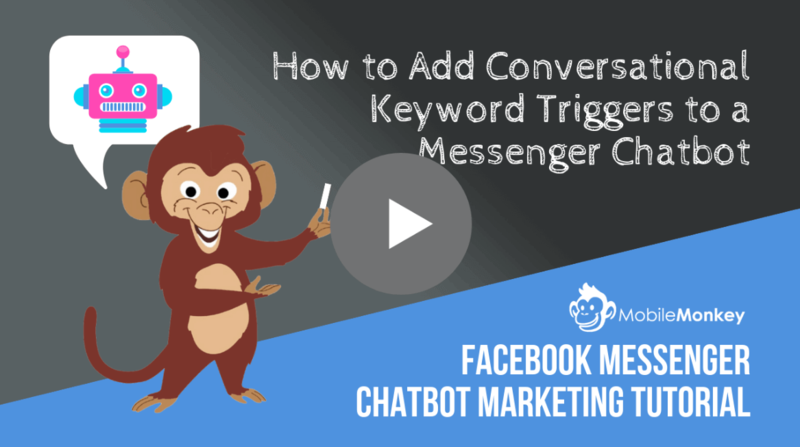 As such, we started by computing a referenced average for the email banner ads that was a simple average of two data points (i.e., average of $9.90 and $8.62 is $9.26). The open rate realized from data point #1 has a major impact on the eCPM computed. In this case, our open rate is much higher than average email newsletters as a result of the quality and level of engagement of our audience. A lower open rate would result in a lower level of earnings and a lower eCPM. Some of the rates considered in data point #2 above represent requested CPMs, and not rates actually paid by advertisers. Based on these factors and our significant experience in this advertising medium, we made a decision to reduce the average CPM by approximately 45% to $5.00.